Millions of animals are currently in shelters and foster homes awaiting adoption. Design an experience that will help connect people looking for a new pet with the right companion for them. 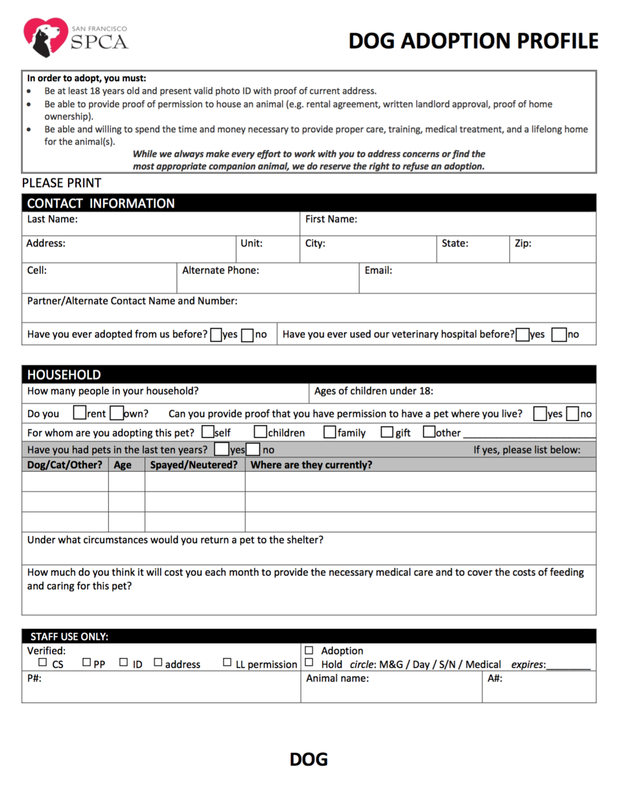 Help an adopter find a pet which matches their lifestyle, considering factors including breed, gender, age, temperament, and health status. Provide a high-level flow and supporting wire frames. Think back to when you first decided to adopt a pet. • What inspired that decision? • When did you make that decision? • Have you owned any pets before? • Was anyone else involved? 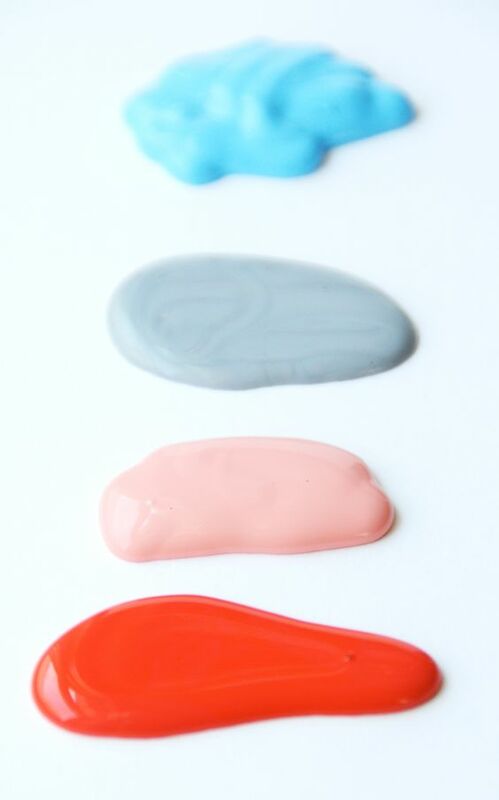 What steps did you take first? Tell me about the process. • How long did the process take, from first decision to finalized adoption? • What was your favorite part of the process? • Least favorite, or most frustrating part of the process? When choosing a pet, what was most important to you? • How did you end up choosing your pet? • Did the pet you chose align with the kind of pet you originally wanted? • Tell me about your pet! Pictures? • What would you do differently next time? • What advice would you give to a friend looking to adopt? I was able to speak with five participants who had adopted a pet within the last six months, to learn of their experiences, behaviors, and beliefs. I decided on non-directed interviews, because I wanted to keep responses in participant language as much as possible, and believe it is a much stronger technique to use during the generative stage—I wanted to be sure I was gathering real, organic stories from participants, and not guiding nor influencing their responses and narratives in any way. Think back to when you first decided to adopt a pet. What inspired that decision? What steps did you take to find the right pet for you? Please walk me through the process. I jotted down a few terms and phrases of topics I wanted to cover, such as others involved and next time, and recorded each interview. • "Not a puppy, but not super old because of cost and difficulties." • "I wanted a small dog, but it wasn't a deal breaker." • "No demonstrated aggression—especially toward people." • "I wanted a small dog because of where I live." • "Definitely a rescue—no breeders or pet shops!" • "I was looking for a chill dog that I could hang out with." "If it was too big, or if it barked a lot and drove me crazy." "I’d look at Petfinder, but then not go through with it—it just wasn’t accessible enough. It was a list of all these dogs, but they would be in different shelters, and I’d have to go and drive out just to see one dog. I just didn’t have the time to do that." “This one just really stuck out, because she was the only one that was not hyper—whatsoever. And she was just laying there, and she looked really sad, so I took her on a walk. And, I don’t know, I just couldn’t leave her there." "We always knew we wanted a cat, it was just about biting the bullet and saying, ‘Okay, let's go get one right now.’"
"We wanted a kitten as young as possible—we wanted to watch it grow." Looked at several kittens they had found online that met her kitten criteria, but fell in love and adopted 2 year old adult cat, Whiskey. "They've done a couple of follow-ups, which I thought was really nice. They called up the next day to ask, 'How was your first night? Did she eat anything? How are things?'" "Not being able to adopt more cats than just Whiskey!" "I work in a pet-friendly office, so I've had doggy-fever for a long time now." "I live with my parents—they're a little bit older and fine with the decision." "I did a Google search for shelters in the area, but none of the dogs I came across on Petfinder and things like that really sparked my interest." "I wanted an older dog for training purposes, and because it was my parents' first time having a dog at home, so I thought it might help ease them into it." Found Max on A Purposeful Rescue's Instagram account: "The description said he's an energetic, spry, 10 year old dog, with a little separation anxiety—but that's okay because my Dad's always home and I work in a pet-friendly office—he's crate-trained, house-trained, perfect." "I Googled finding a pet in the bay area, basically, and Petfinder came up, and that's how I found my dog." "We also involved both of our parents by sending them pictures of the different dogs we were looking at and having discussions after meeting them." • "I wanted a dog that was comfortable walking around—a good leash walker." • Mid-size dog—very important: "We didn't want a dog that has to be picked up and carried around, but we also didn't want a dog that could overpower me." "We confirmed what we could about what we had seen on FaceTime, and those were the most important qualities to us, so we took him home!" I spoke with two experts: one from a large, public shelter—the SF SPCA—and one from a small, foster-based rescue program, to get the best and most holistic representation of the problem and current solutions. Transcripts of those conversations here. • What's your process for matching people with pets? • What’s the magic? What secrets have you learned through your experience? • In your experience, do people know what they want, or is there a mismatch between what they think they want and what they end up choosing? My biggest take away: adopters need to be matched with the right pet—the first time—in order to stop the pet turnover problem from perpetuating. "I’ll tell you right now, that missed opportunities are the single greatest danger to the animal adoption process." 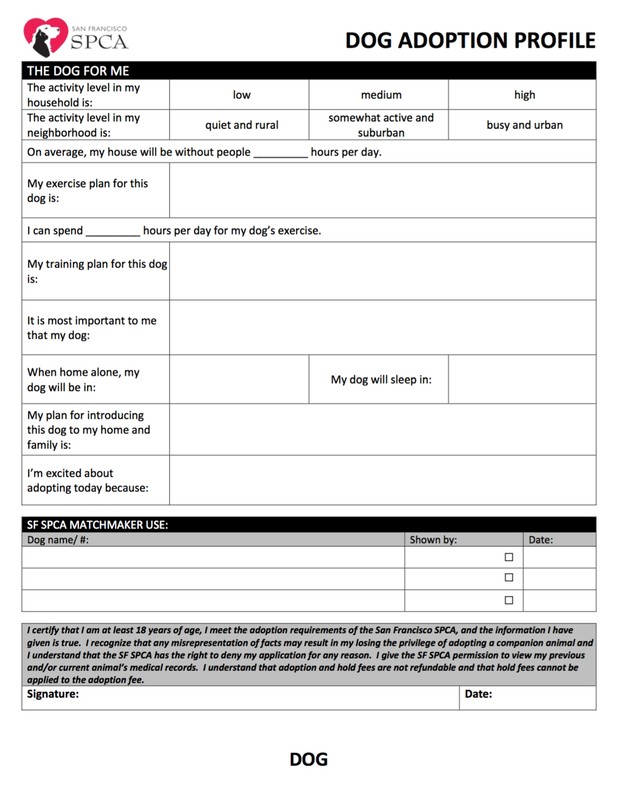 Due in large part to availability of research resources and time constraints, I scoped my project to dog adoption. After discarding data gathered from my non-directed interview with cat-adopter Sree, I began step one of my research synthesis process. I wrote quotes, facts, insights—anything and everything I deemed important—from my user interviews on post-its. I grouped post-its by similarity to uncover patterns and themes, labeled each group in pink, and photographed my work for documentation purposes, and to reference later for framework development (see day four—frameworks below). 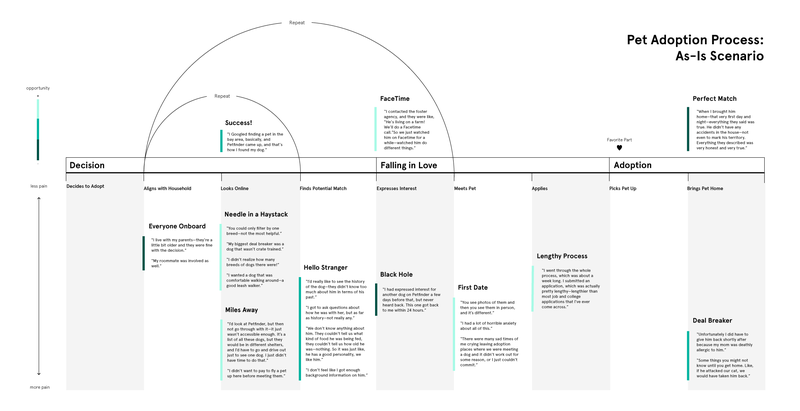 I referenced my synthesized interview data to create an empathy map. Disclaimer: Due to time constraints, I did not spend as much time on this step as I usually do / would have liked. Due to time constraints, my collected data and subsequent insights are based only on four users. While not a large enough sample size to be considered statistically accurate nor representative of a population, this work reflects my process on a small, quick scale. • Mentally identifies what they're looking for in general terms, e.g., "good leash walker" and "chill"—not specifics, e.g., "Bernese Mountain Dog"
• Current pet adoption site filters fail to help adopters find the most important qualities to them—e.g., "good leash walker"
I used the above resources to generate an as-is journey map of the full adoption process to map out pain points and opportunities for ideation, concept generation, and design. Artifact available here. • "I’d look at Petfinder, but then not go through with it—it just wasn’t accessible enough. It’s a list of all these dogs, but they would be in different shelters, and I’d have to go and drive out just to see one dog. I just didn’t have time to do that." After developing the content inventory, I facilitated a card sort activity with a participant and potential user to improve alignment between the information architecture of my solution, and my user's mental model. Once I had initial wireframes mocked-up, I tested an early version of my prototype with two participants. I sent them each a password protected link to an InVision prototype, gave them two tasks to complete, and asked them to think aloud while moving through the prototype. After making a couple of necessary fixes, in response to problems revealed through user testing, I brought my wireframes to the next level of fidelity. My user thinks about what they're looking for in generalized terms such as "good walker," "chill," and "cuddle buddy"—not specifics like certain breeds ("Bernese Mountain Dog") or exact age. Current pet adoption site filtering systems do not allow users to filter for what is actually most important to them. To incorporate my user's current mental model into my design, I decided to incorporate a tagging system. During on-boarding, and any time after, users can select tags representing concepts and criteria that are important to them in a pet. Interview participants referred to some criteria as "absolute musts," and others as "deal breakers," but current systems only allow for polarized selection. As it stands, there is no way for users to indicate preferred criteria—but not deal breakers—without excluding potential matches. Because my user places varying degrees of importance on each criteria, I wanted to maximize control over preferences. By creating a system in which users can identify criteria as either a must-have, nice-to-have, or deal-breaker, and fine-tune that order them within each category, users are able to construct a more accurate representation of what they're looking for. Using force-touch + drag, users can order their list of tags to fit their specific wants and needs. Additional tags can be added at any time by pressing the +, which takes users back to the screen above. Users can search for any number of tags and browse through adoptable pets that meet their most important criteria. Users can save pets they like by touching the heart icon on a card to be easily accessed later on. One of the biggest pain points users complained about during their non-directed interviews, is that available dogs are located either far away or all over town. 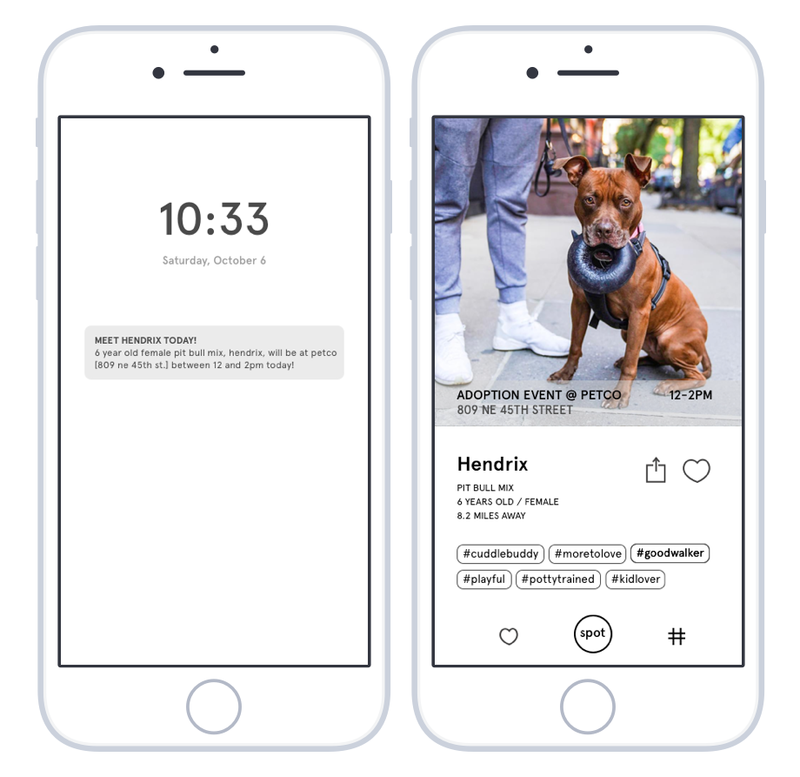 To alleviate some of that pain, my solution features nearby notifications, that let the user know—in real-time—when a dog that meets their specified criteria is adoptable and available nearby. This would solve the problem described in the third quote above—had Devin had this solution, he would have been notified the moment a new, local dog—that fit his description—was entered into the system. Additionally, a user might unknowingly be in a part of town with an adoption event nearby, including one or more dogs that match their criteria. Since there are so many rescues, organizations, and events to keep track of, this feature would prevent both the user, and dog, from a missed opportunity. "I’ll tell you right now, that missed opportunities are the single greatest damager to the animal adoption process." The most important and most frequently used task by users: browse through a list of adoptable dogs. My interview participants described large photos and videos of the animals as super helpful during the "online shopping" phase, and described proximity as a top priority factor. 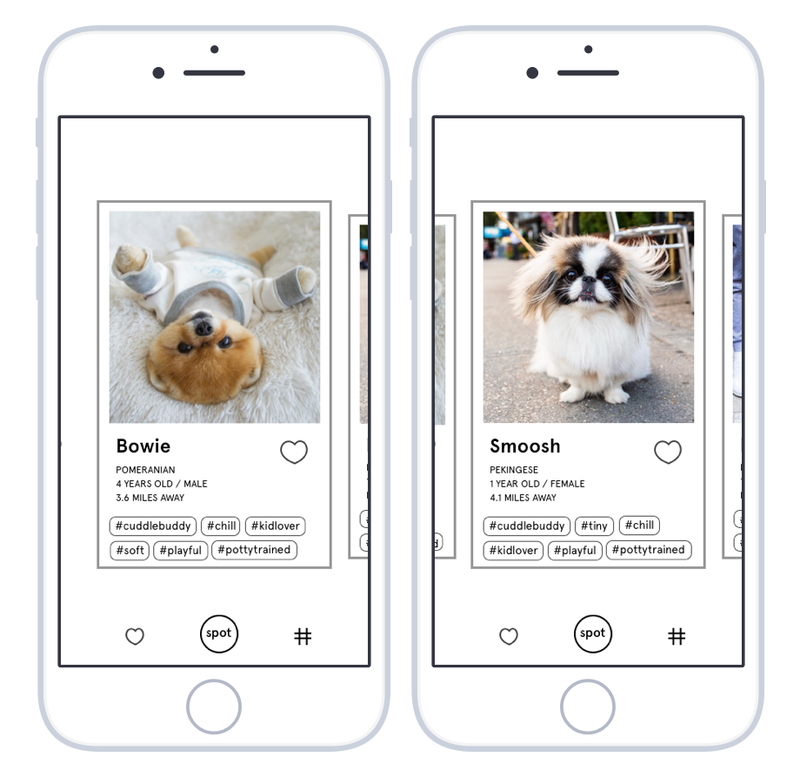 Thus, I designed a Tinder-inspired interface with cards for each dog featuring large photos, along with dog name, proximity to the user's current location, and a list of tags that match their own—decisions based on card sort and interview data. 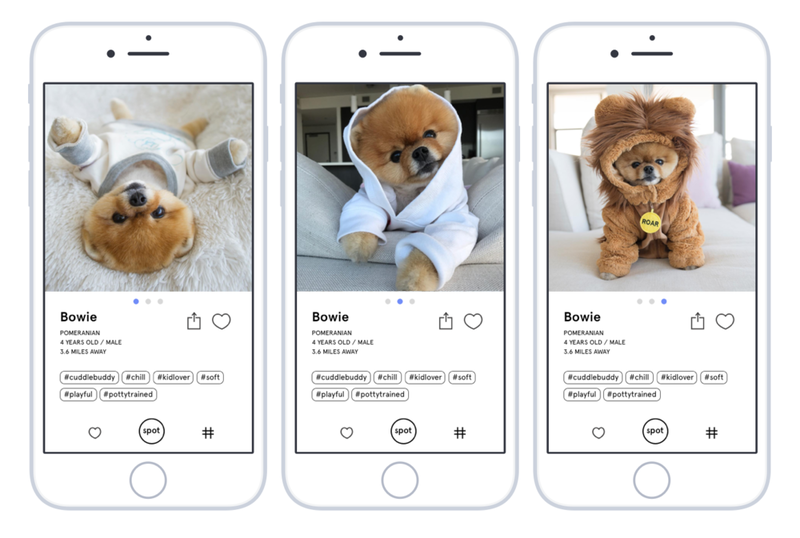 Unlike Tinder, however, users swipe through a carousel of available pets matching their criteria—swiping right or left does not indicate a match nor result in the removal of a pet. Learn more about an individual pet, or see additional photos and other media, by clicking on a pup’s profile card. COMPLETE user flow chart here. Browse through adoptable dogs with tags that match your own, save your favorite pets, then check out your list of favorites. After checking out your favorites, add #goodwalker to your list of tags, then check out other dogs tagged #cuddlebuddy to find more! I would absolutely love to get my prototype in front of more users, to continue iterating on my design. My most immediate next step would be to bring the prototype with me to the SPCA, and do some guerilla testing with potential adopters and expert volunteers. 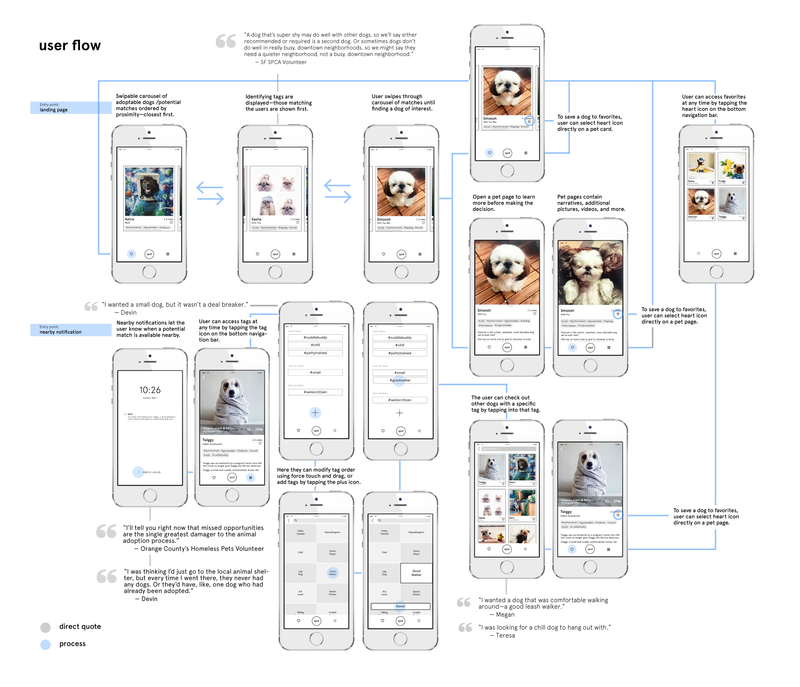 With more time, I would begin crafting a visual design language for my app. Beginning with mood-boarding—a process I began below—I would ideate on logo ideas, colors, and other ways to brand and improve the experience of my product. 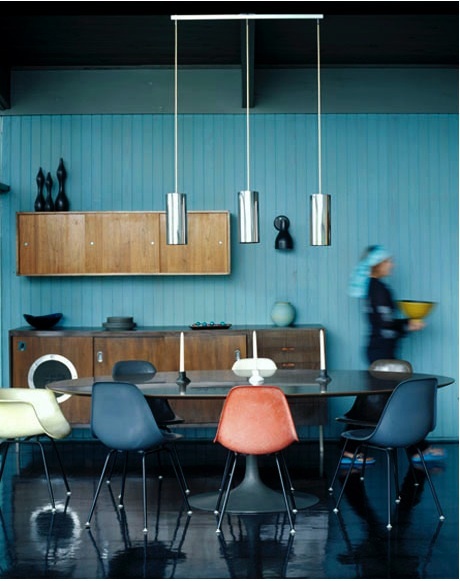 What an incredible project to work on! As someone who volunteered at an animal rescue in Los Angeles—and fostered almost a dozen kittens during that time—it is a problem close to my heart and one I loved the opportunity to help solve! Additionally, I used this project as an opportunity to start experimenting with Framer.js—SO MUCH FUN—and was inspired to improve my information design skills, so I signed up for this class as well! I learned so much working on this project, and enjoyed the process very much. I spent too much time on generative research. While it is my favorite part of any UX process, it cost me a lot of interaction design, visual design, and evaluative research and iteration time. If I could go back in time and adjust my strategy, I would scope my project to only dogs sooner, saving me time on finding, scheduling, and interviewing out-of-scope participants.